Intermittent closures on Alder St. between 3rd St. and 5th St. Intermittent closures between Alder St. and Birch St. from 3rd. St. to 7th St.
Traffic revisions at the intersection of Olympic Highway North/W Alder St. and N 7th St. remain in effect until further notice. 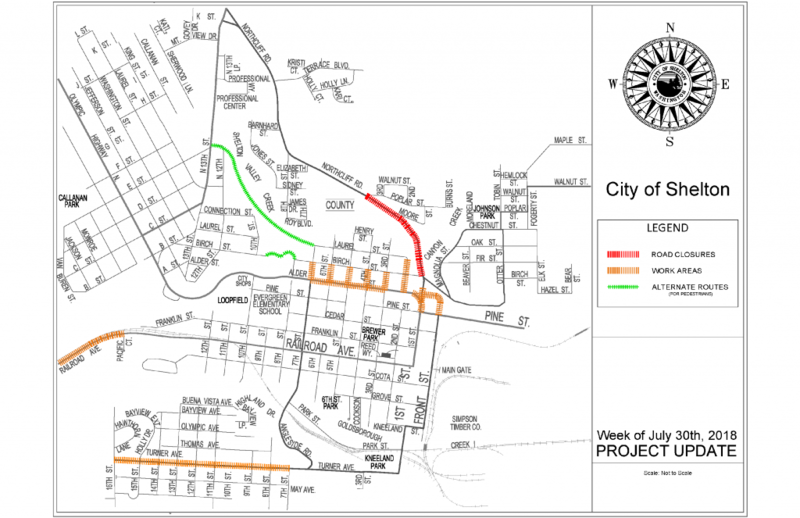 Northcliff Road will be closed between San Joaquin Avenue and Poplar Street through August 3rd for the installation of a new sewer main. Use Olympic Highway North as an alternate route. Intermittent closures on 2nd St. between Alder and Laurel. Intermittent closures on Front St. between Highway 3 and Alder. Intermittent closures on Alder between Front St. and 1st St. Intermittent single lane closure on Railroad Ave. between Pacific Court and Highway 101. Crews will be working on a road edge treatment along Turner Ave between 7th St. and 16th St. No scheduled closures or detours.